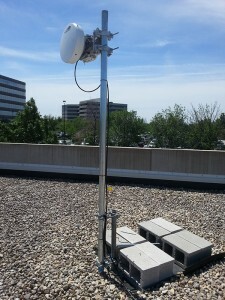 There is a tendency to think satellite and the service E-vergent provides, Fixed Wireless, are the same. In fact they share some common concepts but the actual service delivered, is very different. Satellite service requires the equipment at your location to “talk” to a satellite in orbit. That means the wireless signal needs to travel great lengths, typically about 22,236 miles! That long distance is the main issue with satellite service. When a link is that long, heavy rain storms can cause the service to intermittently cut out. Plus, that distance creates a gap between ISP’s latency and throughput. Latency is how long it takes to send a signal over the link measured in milliseconds. Throughput is a term used to define the measure of the capacity of the link such as 10Mbps. Even at the speed of light, which wireless travels at, there is an inherent “satellite delay” with satellite Internet service that fixed wireless doesn’t have. Anyone who has seen live news reports on satellite TV has experienced this. Imagine every time you pull up a new web page or email and experiencing that “satellite delay”. That would get old pretty quick. Satellite’s latency, or perceived speed is almost 20 times slower than a land based service such as E-vergent’s. This is because the E-vergent signal is traveling a fraction of the miles compared to satellite links. The other main issue with satellite Internet are data caps. Data caps are when the service provider either slows your connection or charges you for extra usage of data. When evaluating a satellite service make sure you check their terms of service because satellite services generally have the most strict terms of usage in the industry. Their data caps are low and and they can vary depending on the time of the day. Data caps are a very real concern if you are watching Netflix or other streaming video. According to Netflix an HD stream can use up to 2.8GB of data per hour. If you have a 10GB monthly data cap, that transfer limit can be reached within roughly 3.5 hours. Then you are paying expensive overage fees, potentially up to $10 per each additional 1GB. E-vergent provides land based links that are short connections, generally less than 10 miles compared to a 22,000 mile satellite link. E-vergent connections do not have a “satellite delay” and are about 20x more responsive to clicks or page changes. We do not have data caps which can either significantly increase your costs or limit what you use your internet connection for.